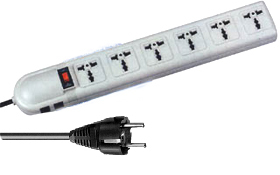 This 6 universal outlet Surge Protector has the highest clamping voltage rating that is given at 300 Volts. This surge protector comes with a European “Schuko” style plug. When used with the optional WA-GF adapter, it can be used with any of the grounded plug adapters shown in our World Electric Guide The BB-13-6 surge protector can then be used, with the appropriate grounded adapter, anywhere in the world where the voltages are 220/230/240 volts. Protect computers and other similar devices against damage from most harmful power surges.